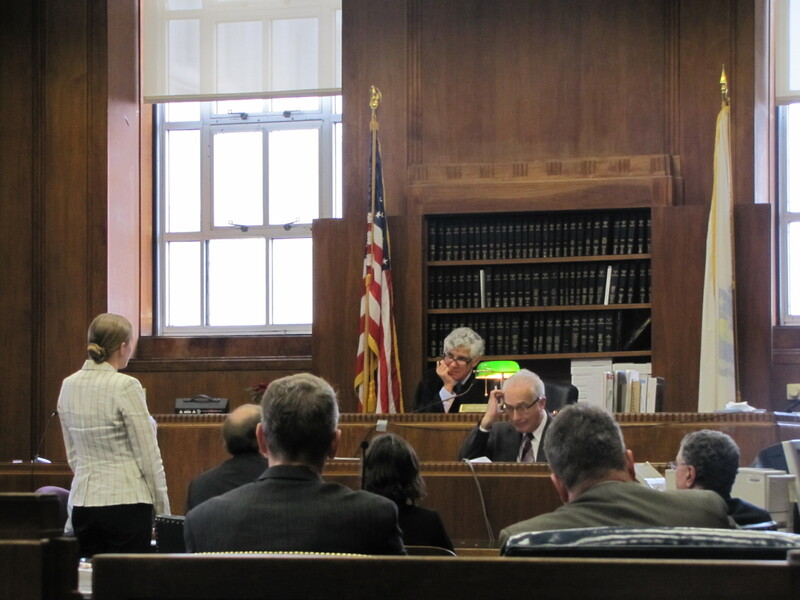 Judge Brassard hears from a plaintiffs' attorney during a final fairness hearing at Suffolk County Superior Court. On the eve of the eighth anniversary of the Bouchard 120 oil spill, a state judge has granted final approval for a $12.4 million class action settlement that requires Bouchard Transportation Co., Inc. to pay damages to hundreds of Mattapoisett property owners whose beaches were contaminated with No. 6 fuel oil from the April 27, 2003 spill in Buzzards Bay. Judge Raymond J. Brassard signed off on what he called a “carefully detailed” and “thoroughly negotiated” settlement during a final fairness hearing held Monday at Suffolk County Superior Court in Boston. No objections were heard, because none were filed by class members. The parties reached a settlement in January, nine months after a two-week jury trial determined that Bouchard owed varying amounts in damages to eight Mattapoisett property owners who lost the right to use or enjoy their beaches for months or years after a Bouchard barge spilled up to 98,000 gallons of oil into the bay. The trial was part of a broader class-action lawsuit involving 1,104 Mattapoisett property owners. Settlement payments, which range from about $5,000 to $30,000 per property, were calculated using a complex formula. To date, 873 class members– nearly 80 percent of the class– have submitted claims for settlement payments, said plaintiffs’ attorney Martin E. Levin of Stern, Shapiro, Weissberg & Garin LLC. “We anticipate that the number will continue to rise as the summer goes forward,” Levin said. The final deadline to file a claim is July 1. According to the settlement, if a portion of the $12.375 million maximum distribution amount is not claimed, Bouchard does not have to pay that portion. The lawsuit was filed on September 29, 2004 by class representatives Kim DeLeo, Francis Haggerty and Earl Cornish. Levin praised his clients for initiating the suit and “following through” so that the people of Mattapoisett could be fairly compensated for the lost use and enjoyment of their beaches. After the hearing, a handful of class members gathered outside the courtroom for the last time, exchanging hugs and victorious smiles. “We fought the good fight, and we did it for our kids,” said Joseph DeLeo, who carried his young daughter on his shoulders.